Last December I took the opportunity to drive the length of North Island with my Kiwi flatmate Nicole. The trip was a chance for her to see parts of her own country she had never seen, and for me to see many parts I had never seen as well. It wasn’t a specifically birdy trip, but there were certainly birds to see and some of them were sufficiently interesting that Nicole could look at them without falling into a boredom induced coma! So now that I have finished making you all feel sad about the extinctions of New Zealand, it’s time to give my trip report. 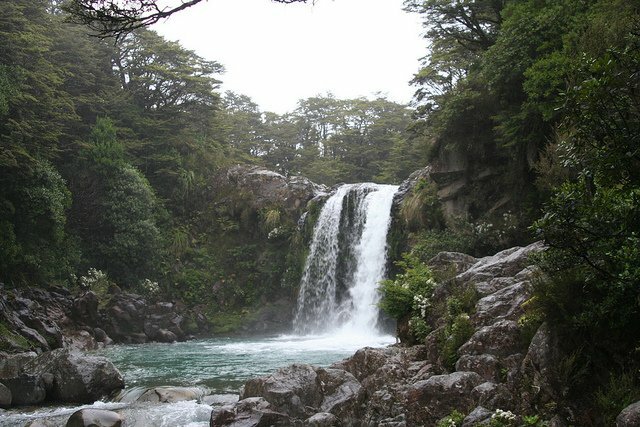 Our first leg, driving north out of Wellington, was to the town, village, hamlet of National Park. Situated in the centre of North Island between Wanganui National Park (which we didn’t visit) and Tongariro National Park, which we did. Tongariro is New Zealand’s oldest national park, gifted to the nation by the local iwi (Maori tribe) in order to protect it from development. And it’s a good thing too. Mount Ruapehu, as seen from National Park Village. 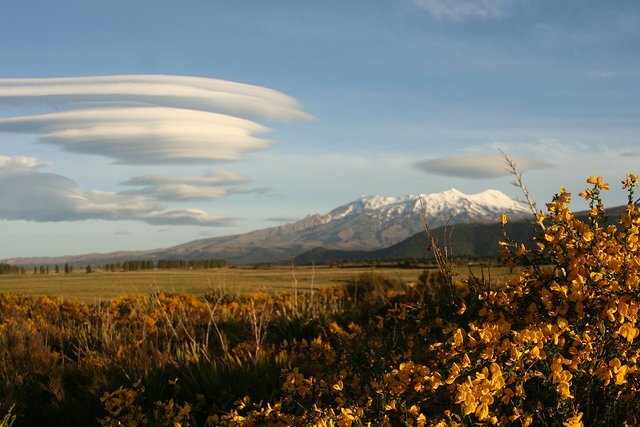 We drove up on the Friday, planning to do the famous Tongariro crossing on the Saturday. High winds and low cloud nixed that idea, so we spent the Saturday looking around the lower parts of the park, getting very very wet in the process. Of the three highland specialities of New Zealand two, the Rock Wren and the Kea, are not found in North Island, but the third, the Blue Duck, is. The Blue Duck is a fast water specialist, in much the same way as the Torrent Duck of South America is, and so we hunted through various fast moving streams a the foot of Mount Ruapehu to see if we could find one. 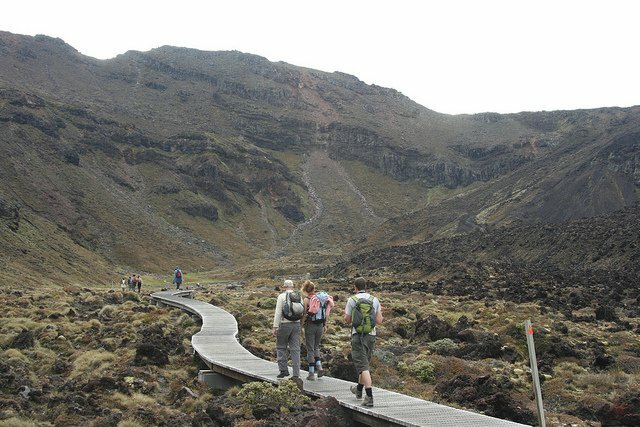 The scenery was like something out of the Lord of the Rings, as was much of the scenery in the park, indeed Mount Ruapehu was used for Mount Doom in the third film! Can you see the orks? We didn’t find any Blue Ducks, but the forests had Riflemen, New Zealand Fantails, Silvereyes and Tomtits. The latter is a species I haven’t seen around Wellington, and is a smaller relative of the New Zealand robins. They are quite variable in their appearance across New Zealand, and reaching several of the far flung outer territories. The open areas also had New Zealand Pipits, but the dreadful weather soon had us retreating back to the hostel to dry off and have a beer by the fire. The following day we were joined by three more friends, Abi (of Kapiti fame), Tim and Darren, in order to take on the Tongariro Crossing, a 19.4 km hike between the summits of Tongariro and Ngauruhoe, two mountains to the north of Ruapehu. The Crossing is the most popular day tramp (as hikes are known in New Zealand) in New Zealand, and regarded as one of the best in the world. The crossing starts above the tree line, and begins with a deceptively simple walk up to the first hard climb, which looms when you start the walk and looks positively terrifying when you reach the foot. Insert the inevitable comparisons between Mount Doom and hobbits here! After the first climb the walk levels out somewhat, but the landscape has changed completely, its a flat, empty moonscape of ice, dried up lakes, and little vegetation. 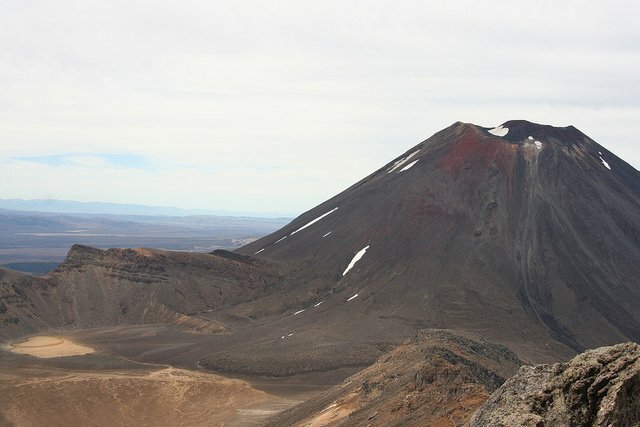 To the right looms the summit of Ngauruhoe, and optional climb for the masochists. Behind you, far in the distance, beyond even National Park Village and even Wanganui National Park, lies the cone of Mount Taranaki. Tim, Abi and Darren just before the first climb. A second hard climb left us teatering on the edge of the Red Crater, at which point rather than begin our descent we chose to take on the second of the option side excursions, to the summit of Tongariro itself, 1967 m high. This afforded us great views from taranaki in the West to Lake taupo in the north, and, oddly, a great number of labybirds (or ladybugs, depending on your preference). Mt Ngauruhoe as seen from the summit of Tongariro. On the valley floor you can see the crossing. Back on the Crossing proper, and the walk down the Red Crater is an adventure and a half! The trail is steep, and into soft volcanic sand that sinks as you step down, causing you to half walk, half ski, half fall down the trail. You certainly don’t envy the trampers doing the trail in reverse! Beneath us were soda lakes, and steam and smoke emerged from the ground around them. 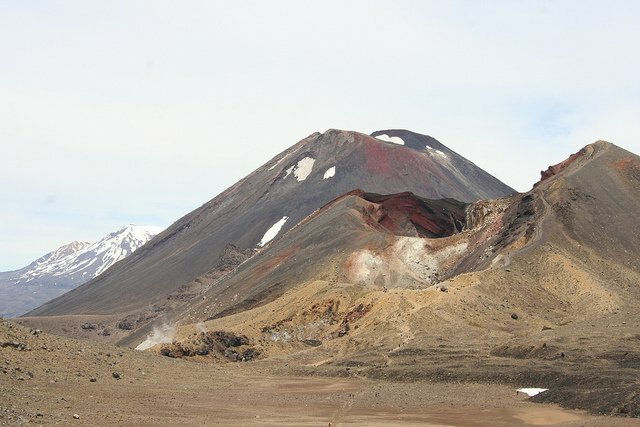 Red Crater (with trails) in front, Mt Ngauruhoe and Ruapehu behind. Beyond the Red Crater was Blue Lake, where we had lunch. Here we saw two birds (finally, you gasp! ), the first we’d seen in a while. One was a Kelp Gull, flying across the lake, the second, heard first and then seen very distantly, was a Banded Dotterel. These plovers nest across New Zealand, from sea-level up into the mountains, and most of them migrate in the winter to Australia (where it is known as the Double-banded Plover). This was a lifer bird for me, so I was very pleased to see it on a non-birding day. 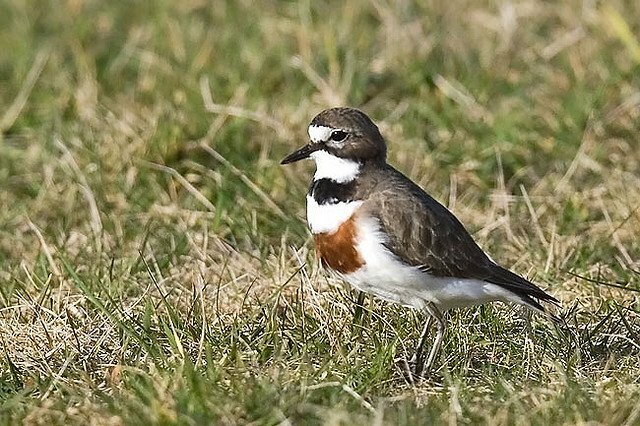 Banded Dotterel (Charadrius bicinctus) by 57Andrew. Released on Attribution Non-commercial No-derivs. From the Blue Lake it was downhill all the way, dropping first into alpine scrub and then, eventually, into forest. The forest held a number of species, although by this point we weren’t really in much of a position to register much. The North Island Robin was certainly a nice sighting away from mainland islands. The most fantastic sighting was at the carpark at the end of the 8 hours of walking. As we lay on the ground waiting for the bus to take us back to the hostel we heard a loud sound that struck me as sounding like an asthmatic cicada (although the guide book describes it as “falcon-like”). Then it was replied to by another flying high up, and I saw only my second Long-tailed Cuckoo in New Zealand. I followed the sound of the first for a few minutes around the car park, and eventually got excellent looks as it clambered around in a tree. Long-tailed Cuckoos are really awesome birds, they have the longest overwater migration of any landbird, flying out across the Pacific to islands groups as far away as the Phoenix Islands. They are in the same genus as the koels of Asia and Australia, and are sometimes called Long-tailed Koels to distinguish them from the long-tailed cuckoos of Africa. For all that it was almost impossible to muster any interest from my friends, and I really can’t blame them. I could have taken a great photo of them, had I been able to operate a camera. Very nice tale, and stunning photos! Reminds me of the trail between Freshwater Landing and North Arm hut on Stewart Island. Highly recommended for anyone who wants to die in style. Terrific journey through some phenomenal terrain, Duncan. I can’t wait to visit Mt. Doom one day. Want Your Picture to Appear Next to Your Comments?